I have joy in bringing two together, but darning my existence! My life hangs by a thread, filled with ups, downs and resistance! 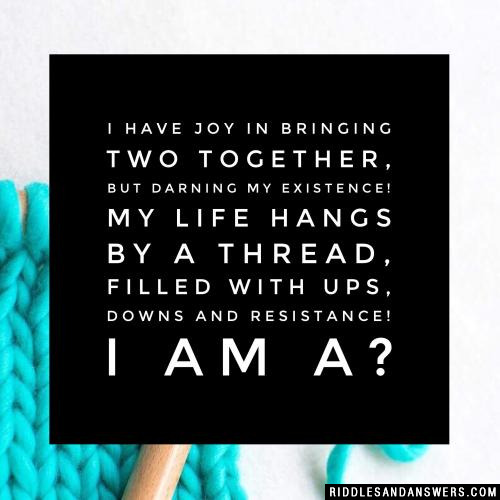 I am a? Why was the jelly so stressed out? It was spread too thin. What did the lumberjack say to the tree? I have an axe to grind with you. What do cowboys like on their salad? Why was the rope so stressed out? Who fills your tank at the gas station? Can you come up with a cool, funny or clever Riddle Questions And Answers of your own? Post it below (without the answer) to see if you can stump our users.